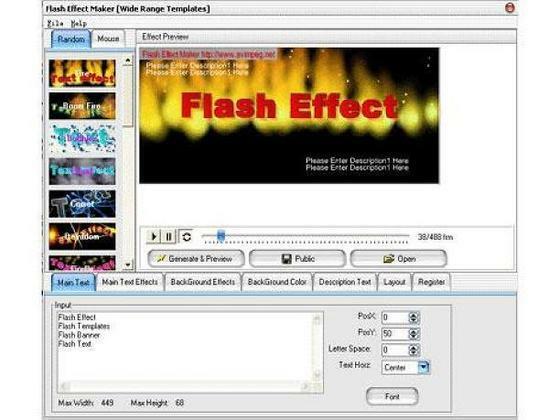 Cool Flash Maker Pro is the great flash web design tool to help web master design animated flash medias. Cool Flash Maker Pro is very user-friendly, wide range HTML/Flash Templates ready for use, and you don't need any Flash or programming skills to use Cool Flash Maker Pro. Wide Range Cool Flash Banner, Flash Text, Flash Intro, Flash Navgation, Flash Menu and Flash Web Site customizable templates help you design your cool flash website. ...... Cool Flash Maker Pro is very user-friendly, wide range HTML/Flash Templates ready for use, and you don't need any Flash or programming skills to use Cool Flash Maker Pro. Wide Range Cool Flash Banner, Flash Text, Flash Intro, Flash Navgation, Flash Menu and Flash Web Site customizable templates help you design your cool flash website. * Cool Flash Maker supports UTF8/Unicode, English, Dutch, Italy, French, German, Portuguese,Spanish, Chinese, Japanese and more Interface. Hebrew and Arab Right to left text also supported. Make your own screensavers from your favorite Flash movies. Christmas Flash E-Card Maker and Editor to Maximize your Creativity. The leading Flash SWF Editor can easily create Flash animation and edit SWF. Qweas is providing links to Cool Flash Maker Pro 14.00 as a courtesy, and makes no representations regarding Cool Flash Maker or any other applications or any information related thereto. Any questions, complaints or claims regarding this application Cool Flash Maker Pro 14.00 must be directed to the appropriate software vendor. You may click the publisher link of Cool Flash Maker on the top of this page to get more details about the vendor.